And so it came to pass that yet another event planned and put on by a select few couples here at Beacon Terrace was a huge success. If you will recall, I made mention of the various events coming up within our retirement community during my last post. 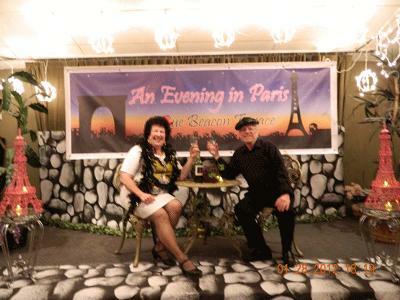 Well, I am happy to report that after a considerable amount of work and planning by a few couples here at Beacon Terrace, approximately 150 people attended the event entitled “An Evening in Paris”. 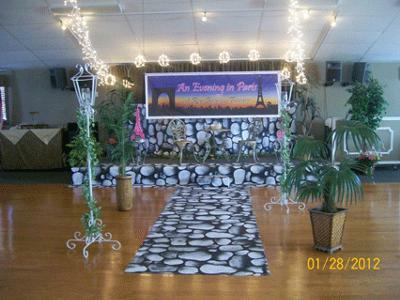 The theme “Evening in Paris”, planning, and preparation for this party was the dream of some good friends of ours, also residents of the park. The idea was designed to transport guests to a café located near the Eifel Tower in Paris and thus we set out to turn a portion of our clubhouse into a scene, if you will, similar to one found in Paris. Check out the pictures of the transformation of how we started with the barebones idea of a Paris café and turned it into a fabulous night many folks will be talking about for weeks on end within our community. 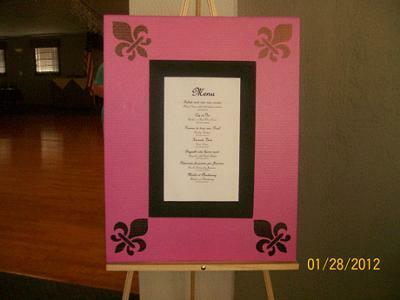 Arriving guests could have their pictures taken in front of the Eiffel Tower and then be escorted to their table. A roving violinist made the evening seem even more real as she worked the room playing violin music for the guests. The meal served was made and prepared by the couple whose idea it was to have such an event. Dinner was served in stages beginning with French bread and salad, followed by a sorbet to cleanse the palate, with the main course being served immediately afterwards. 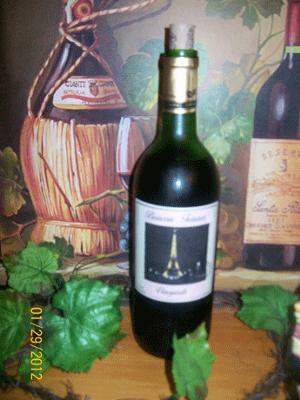 Two bottles of wine were served at each table with a label designed to make it appear that the wine was from our own Beacon Terrace Vineyards. After dinner guests were invited to partake of many tasty French desserts prepared by yet another wonderful couple residing in our park. Coffee was also provided. The evening was a huge success and while those of us involved with the whole project said – OK – that is it, we did it and do not intend to make this an annual affair, one begins to wonder, hmmm – what theme could we think of and plan for the next time. Fortunately that will be next year as events such as these are but once a year projects. Perhaps we could go to Italy! Wendy: WOW! Looks like great fun! I had to remove the "before" photo as this only allows a few, but just had to say "Irwin, You Guys did a GREAT JOB!" Fun Fun!